Cherries are a must have summer treats. They are great in dessert or simply popping them in your mouth. There are still plenty of cherries out there but for now I can only find the Bing cherries and not the Rainier. They are both different in color and flavor. Bing cherry has a deep red skin with similar colored flesh while the Rainier has translucent flesh and yellow skin with a rosy hue. I prefer Rainier because they are bigger, much sweeter and more refined in flavor. They have a very short season of availability, so I will always grab some when I see them. I splurged quite a bit of $$$ each season on this particular fruit as they are the most costly than the regular Bing cherry. Anyway, I reserved some of it to use it in the frangipane tarts. There recipe is the same as Peach Frangipane Tarts and I re-post it here again. 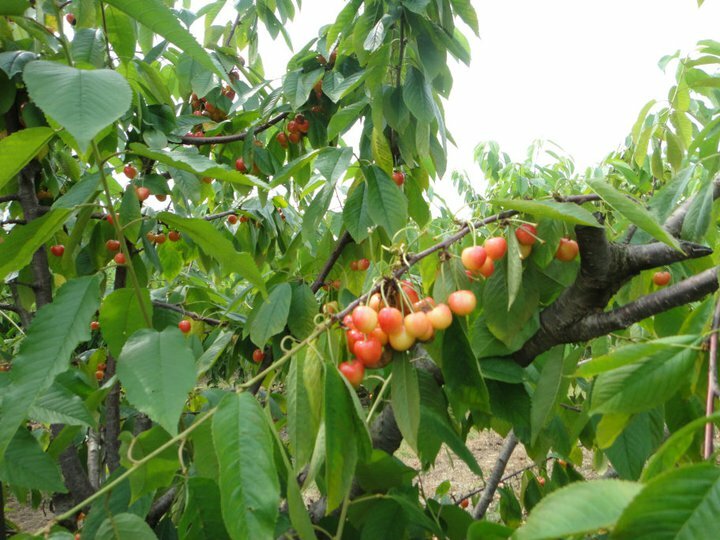 Here is a bit of history on Rainier Cherry. Rainier cherries are especially large, sweet cherries developed by researchers at Washington State University. These cherries are highly prized in the Pacific Northwest for their superb flavor, and several nations, including Japan, also import large amounts of Rainier cherries when they are in season. As a general rule, Rainier cherries are more costly than other cherry varieties, but some consumers feel that the added price is worth the superb flavor. Thanks Michelle and Karen for the cherry trees pictures. 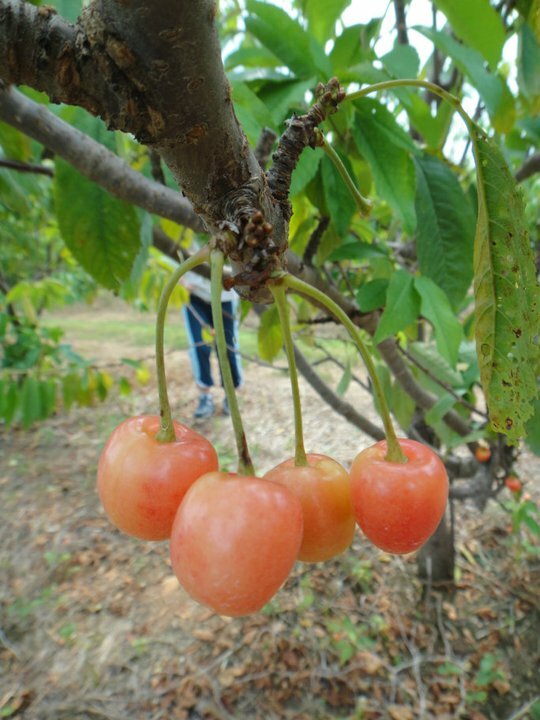 These cherries were bred in 1952 by crossing the well-known Bing variety with the Van cultivar. The result was an unusually large golden to orange cherry with sweet yellow flesh. 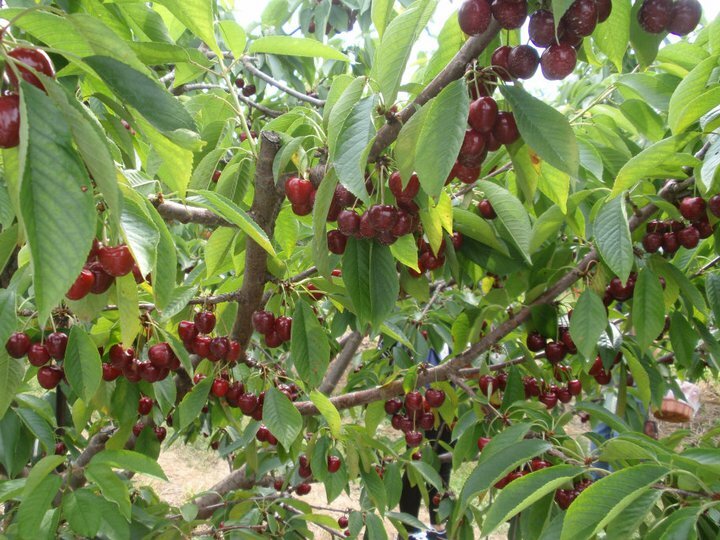 The pomologists who developed the Rainier cherry named it after Mount Rainier, a landmark in Washington State, and a number of cherry orchards began producing the crop commercially. Several things distinguish the Rainier cherry from other cherry varieties. The first is the unusual and distinctive color discussed above. Rainiers also have a tender texture which is almost creamy, and their sweetness is much higher than that of ordinary cherries. Many producers wait until their cherries are at the peak of sweetness before picking, so that they can negotiate the best price for them. This can expose farmers to loss, because birds are big fans of the sweet fruit, and they can consume up to a third of a crop. 1. Put flour, butter, sugar, baking powder and salt into a food processor fitted with metal blade. Process until the mixture resembles fine breadcrumbs. 2. Then add in the egg yolk. With the motor running, add in the cold water in tiny trickles, until the pastry just hold together. 3. Remove from the processor, press together into a ball, wrap in plastic wrap and place in the fridge to rest for half an hour. 1. In a mixing bowl, cream butter, icing sugar and vanilla together until well combined. Add the eggs one at a time and beat until well mixed. 2. Add in the flour, almond meal and milk powder. Mix until well combined and set it aside. 3. Greased 12 tart pans (I used 1 1/2" diameter tart pans) and pre-heat the oven to 375 degree F. Roll out the pastry and line the tart pans. Spoon the frangipane cream into the pastry tarts and fill it to about 2/3 full. 4. Top it with a cherry. Repeat the same to the rest of the tart shells. Baked for 25-30 minutes until the top is golden brown. 5. Heat up the apricot jam in the microwave for 20 seconds. Brush it all over the warm tarts. I like both Bing and Rainier cherries but the Rainier cherries do have a more lovely color.Your cherry frangipane tarts look so good! Frangipane is new to me and I've been seeing it on the web. It sounds really delicious! I love cherries too! But as Shirley said they are expensive, hopefully the price will drop one day so I can bake this Cherry Frangipane. Wow! The cherries looked so fresh and delicious! and also your tarts. The colour looks so much different! Are these as sweet as the other one? Btw, the tarts look good with them. Fragipane always yields very nice for fruits tart! No doubt, these little cherry tarts are truly yummy!! Yup they're expensive here too, but I love Rainier cherries- and your history was really helpful! And i bet the frangipane filling tasted awesome with those cherries! your tart look nice and good, i like to eat fresh cherries too. I love the look of these pies, I do love eating the cherries fresh too! and Im following you, love your blog! Ann, even here in the US they are pretty expensive compare to other fruits. Kristy, yes they meatier and sweeter than the red ones. Kitchen Corner, yes I love making these tarts. Bee Bee, I tried out your recipe previously. Linda, like my previous posting I used Peaches. You can always use other type of fruits for the tarts. Me too love cherry. Recently Australia imported lots of cherries Fr US. But we will enjoy aust cherries soon end of the year. Will have a try on ur recipe for sure.